let's say I want to use my 500 serie chain to process a stem in my DAW. But, when I plug a cable into my ES-3 or/and ES-6, some digital noise appears on my speakers. So I assume there is a problem between the speakers and the ES-3/ADAT? I highly suspect that ADAT interface. Problem appears even if the 500 serie is turned off (but still plugged into ES-3/ES-6 ofc). Before this setup I used a Lyra Prism and didn't have this problem, could still use my 500 serie with no noise. So I don't think the problem come from here. Any ideas? tests to do? How is your modular powered? Sounds like a classic ground loop problem to me. So I guess you're using a switching power supply with that? Have you tried a DI box in the signal chain to break the ground loop? Yes, a switching power, that one that came with Mantis. but it doesn't change anything when I ON/OFF it. Can you recommend me a DI box I could buy to try? Are you sure it's not coming from UsbStreamer? I don't have a recommendation for a DI box, sorry. 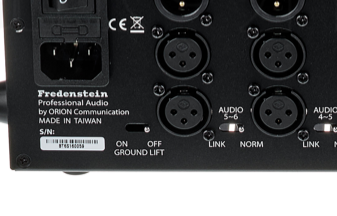 The joy of ADAT is that it's optical - there's no way an ADAT connection can introduce a ground loop. Ok, thanks, I will investigate and check which DI box I can buy!